Looking for Genuine Engagement Ring Advice? Getting accurate engagement ring advice is not always as simple as it sounds. 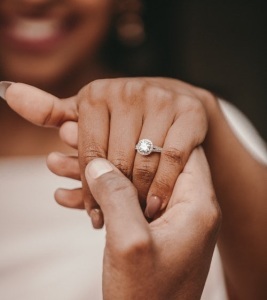 Whether you are planning to pop the question or you are trying to find ideas for your own ring, it is natural to get input from friends, family and other people when making the decision. Some may know instantly what they want – most need a bit of time to think. This is, after all, a ring that will be worn forever. As such, it makes sense that you would want to make an informed decision. In this short guide, we share some tips on who best to NOT ask for advice when planning an engagement ring, and who to rather ask instead. Moms or any other relative. The exception to this rule is, of course, any relative who truly knows your style. If you are proposing to your love and asking for advice from family, it is best to speak to the relative that is closest in age or the relative who frequently goes shopping with your love has brought her jewellery before or has a very current idea of the type of jewellery she wears. Asking moms, grannies or aunts who may not have an accurate idea may end up in suggestions that are outdated or based on the relative's own preferences. Moms may want you to consider the family heirloom ring that is in storage or tell you plenty of stories about what she loved when she got married. Salespeople looking to close the deal. This sounds a bit obvious, but it can be easy to get a bit overwhelmed if you step into a ring shop. Whether you are looking at rings for someone or yourself, the sheer volume of choices can make the process more than a little flustering. Often, salespeople will make the experience even more confusing by offering suggestions that may not be right at all. They may draw your attention to pricier rings or tell you about certain rings that are popular with customers. They may also pressure you into making a decision without giving you time to think things through. Finding a good jeweller online can often take away a great deal of this stress, helping you find time to think and weigh up your options. Friends who do not know your style. Asking a best friend or close family member is often a far better option. Asking friends who do not really know your style or your future bride's style can be risky. If you ask more than one person, you are likely to get many different answers. Most people tend to give advice based on what they themselves would do or wear. Although this can be great for finding ideas, it is not always the most helpful. When you are getting input to help you pop the question, it is even less helpful. Someone who genuinely knows you would be able to tell you what suits you, what you would wear often, and what would be just as stunning in a decade as it is today. On our blog, we work hard to find and share a wide range of tips and tricks to help make the shopping process that much easier. Be sure to follow us to get objective, no-frills engagement ring advice, every time.